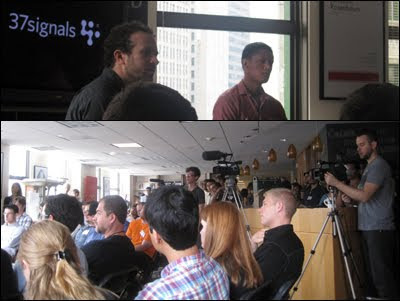 Top: Jason Fried, Founder and CEO of 37signals; Bottom: packed venue at Energy BBDO’s workspace at the second CreativeMornings in Chicago. After experiencing the first CreativeMornings—which made its Chicago debut in June and featured Coudal Partner’s Jim Coudal—I looked forward to the second installment. The guest lecturer was Jason Fried, Founder and CEO of webapp maker 37signals, which used to occupy a part of Coudal’s workspace before carving out their own office. Like Coudal, Fried created his own reality of work, moving from serving clients to serving the customers aligned to his sensibilities—the “laws of attraction” evident here. My interest 37signals team was already established: I’m an avid Backpack user, a regular reader of their blog Signal vs. Noise, and I applaud their atypical business book “REWORK”. Bottomline: I respect a company whose opinions are informed and justified by their doing and redoing. The conference reinforced appreciation for the force behind products that are truly “frustration free” (What other companies can advertise this claim? ), and most of what Fried expressed was consistent with recorded talks I’ve viewed over the years. Maeda: [Build new foundations] “Artists have to get their hands dirty, starting with core foundations and basic principles.” Brass tacks. In designing user interfaces, Fried recommends using a thick black marker to focus on what’s essential and not what’s extraneous. In their book “Getting Real”, which is about building software, and more so about building a business, the method of “epicenter design” reinforces this focus on what’s fundamental and work from here. Maeda: [“Craft the team.”] “This is a principle I didn’t know from art or design. I was very ‘un-teamish,’ very lone-wolfish.” Work culture. Fried repeatedly stated that his company is composed of a few, in the very low double digits, which Field expressed was a lot. Even more important for everyone to get along and share the same vision for what’s being worked on and shipped. Maeda: [“Sense actively.”] “Artists are always trying to sense something.” Curiosity. In an interview at the University of Chicago Booth School of Business, Fried stressed that 37signals only hires curious people. Examining a process or object, minding the details, can lead to self-discovery. Maeda: [“Take leaps.”] Fried’s version of “leaps” is in the practice of making small decisions. This way, the mistakes aren’t large to fix or recover from. Maeda: [“Fail productively.”] Success. In his keynote at BIG Omaha 2009, Fried questioned the promoted actions to fail, fail more, and fail more often. Instead, succeed. Maeda: [“Grow from critique.”] “Anyone who exhibits art or ships product knows that these are quick ways to get critique. Artists want to do this to change, to find out who they are.” Take a stand. Fried believes in having an opinion because it shows that you care for something. If it’s not shared by some—fine. It’s not meant to please everyone. No opinion; no creativity. Big thanks: to organizer Mig Reyes, videographer Craig Shimala, photographer Chris Gallevo and Admin of Awesome Victoria Pater for their great work on making CreativeMornings, Chicago, happen. Typeface of Fried’s quotes is Massive designed by Shawn Hazen, who also makes awesome typographic illustrations for series Creative Roles. Read related post “REWORK”: Audio Review of 37signals’ Book on Less being truly More.